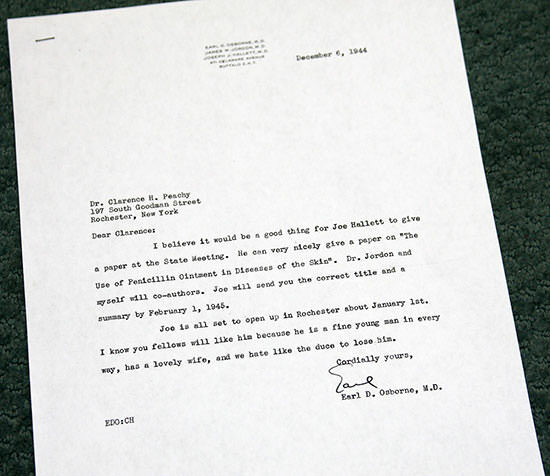 Letter introducing Dr. Hallett to Dr. Clarence Peachey. For over 80 years this practice has cared for the skin disorders of both adults and children. We believe that if you choose us as your physicians, you have the right to understand both your skin condition and your treatment. We take time to listen to your concerns and answer your questions so that you can actively participate in your care. This practice began as two separate practices which were located at Barrington Street (Dr. Joseph Hallett in 1945) and at South Goodman Street (Dr. Clarence Peachey in 1925), both in Rochester. In 1997 the two practices merged with Dr. Leve, Dr. Martin, Dr. Peachey and Dr. Pelton being located together at the corner of Barrington St. and Park Ave. In 2003 we moved to Linden Oaks with Dr. Francis joining in 2003 and Dr. Routhouska joining in 2009. Dr. Haitz joined us in 2015, and Dr. Land in 2017..